Series devoted to saving heirlooms from the scrapheap. Eric Knowles and his expert restorers deal with a rocking chair that needs serious support and an off-colour Madras painting. you to dig out your dusty treasures from the attic. Can they be restored, and should they be restored? And will they make you some money at auction? Find out on Restoration Roadshow. We're at Stonyhurst College, a splendid Grade I listed building here in rural Lancashire. 1794 when it was handed over to the Jesuits. been lovingly restored and maintained to this very day. to my old neck of the woods to keep our restoration team busy. And I know you good Lancastrians are all keen to know if they are worth anything. Certainly they are worth £1,000 of anyone's money. -Can we give Roger the green light on this one? Will the restoration push up their value? £10,600. Do you think that was £400 well spent? I do think it was £400 well spent. Are you keeping them in the family? I couldn't throw it away, because it held so many memories. And if they go to auction, will they make you any money? Tim needs a calculator for his next customer, I fear. This children's chair is in need of some serious attention. Come on, Tim, made it rock in style. And what's this painting from India doing here in Clitheroe? I don't think he was too fond of it because he kept it in the garage. And is the game up for this Edwardian card table? Rod, I know you're a multi-skiller, but do you do fiddly? when the table goes to auction. 'and I didn't realise how many dozens of items you had stashed away in your attics and garages. 'all of them looking a bit sad and in need of a champion. Fergus Brown has arrived with a family heirloom. and not something that was readily available to many retailers. and I'm feeling a little bit like I'm going down memory lane because I used to have one of these. But it is, at first glance, a very elaborate piece of furniture. Is it something that has been used in your family? Well, actually, it's not used. It's always had a lamp on it. so it's a card table, but it was never used. Let's open it up. Would you like to do the honours? So there you are. The baize is nice. This is almost as good as the day it was put in. So you can see, it's hardly ever been used. Is it something you were thinking of selling? Well, I don't use it and it would be nice for someone to use it. -It is a beautiful piece. 'spent their evenings at home and played games for entertainment. 'It's an elegant, English piece. 'with a delicate marquetry inlay made up with a variety of fruit woods, depicting a floral theme. 'Rodrigo Titian who was taught the art of gilding by his father. 'He specialises in intricately painted and decorated pieces. Now, Rod, I know you're a multi-skiller, but do you do fiddly? Because this is a very fiddly job. Well, let's see. How fiddly is it? I am thinking about the inlay, obviously. Yes, I can see. I know exactly what you're talking about. How long have you actually had the table yourself? so it was handed down to me when my parents died. -so it's been in the house for over 50 odd years. There is a little crack here. -A crack along there as well. -But you wouldn't touch the baize? I wouldn't touch that at all. That's lovely the way it is. and it's a bit flattened down. So, Rod, it's a delicate piece of restoration. Repairing the cracked table-top, cleaning away the dust and cobwebs and investigating the inlay. I'd say you were looking at about a minimum of about £250 or so. It's a sizable outlay, but what's the option? -I think it would be worth doing, because it brings it back to its original state. I think this card table is probably worth between £200 and £300 as it is. Remember, it cost Fergus nothing. Rod is looking at £250 to restore. And when it's all done, I reckon it could fetch over £500 at auction. That is if Rod can sort out the inlay and repair the cracked wood. Come on, my man, sharpen that scalpel and steady that hand. Do us proud and make some pounds at auction. but the quality of the heirlooms you bring along put a smile on all our faces. It's a rare piece, I mean exceptionally rare. With such a range of craftsmanship and expertise we can bring the charm and character back again. And I fear that's what's needed in our next case. It's a late 19th century rocking-chair brought in by Pauline and Bernard Oldham. Pauline discovered it when she was helping a friend clear out her junk. She said, "Well, if you want it, have it." If we had left it much longer it would have ended up in the tip. So we took it out of the garage, cleaned it the best we could. All the wicker around the base was gone. So my husband made this little seat. Let's pop that down there and look at your chair, because it has got a bit of age to it. this is dating to the last quarter of the 19th century. they tend to be Austrian and in this case, there it is, Thonet, Austria. it's probably worth about £50 or something like that. Add the seat, there's a good tenner there at least. It really is a matter of what needs to be done because you're thinking of selling it, I'm assuming? If it was done up and worth something, but we never thought it would be worth anything. then the chances are it may be nearer £100 or £150. 'So without a proper seat, this child's rocker is not going to be much use to anyone. 'So it's more a paediatric specialist we need right now. 30 years and it's something of a professional obsession. He finds merit in every single piece he gets to work on. I hope he will find this one irresistible. Charming, isn't it? I really like it. If I can just congratulate you. If you're going to put an upholstered seat on a cane chair, that is exactly how you do it. back into a cane chair without an awful lot of work with regards to removing nails, filling holes. the framework. That looks very sound to me. you get it cracking in between, but that's completely sound. Now it's a question of how much it will cost to restore the cane seat to give it a truly authentic look. 21, 22, 23, 24, 25, 26. 68 and 26 is 94.
and between £30 and £40 to clean it. A bit of a problem that, isn't it? with from the point of view of cost, you might not get your money back. Are you still thinking of going ahead with the restoration? Yeah, I think it would be nice to put it back how it should be. Yeah, I'm really pleased you're having the cane work done. It deserves it. It's a charming chair and it's exactly how it was designed with cane. rocking at auction where I reckon it could fetch up to £150. Victorian charm so it can attract the bidders at auction. We'll be watching you as you count your 94 holes. of Indian art work from the early 19th century is rotting. And will Rod get the dice rolling again on this Edwardian card table? and remove the finish on either side. Many items here today are in the queue waiting to be examined and diagnosed. -Some have been in accidents. Somebody who will forever remain nameless. Others have just worn out. It's just one small step away from the knacker's yard, isn't it? a piece of Indian art which dates back to the 19th century. It belongs to Alan Cantor. It was given to me by my father about 30 years ago. I don't think he was too fond of it, because he kept it in the garage. -So where do you keep it now? -I keep it on one of our walls. In fact, I keep it on the bedroom wall nearly opposite the bed. -Do you know where it came from originally? I was told it came from India, more specifically from Madras. OK. It's a lovely thing. It's got so many colours here in this composite bull and such fine detail in the little animals. -I think it's really fascinating. most likely illustrating a story based on legend or myth. It depicts a demon leading a bull. I'm told these composite animals first appeared in Indian art in the 1400s. ..Louise Drover, who has worked for the V&A and the National Trust. She's had 20 years' experience bringing historical art like this back to life. You can see these spots here. This is commonly called foxing. This is probably from damp when it was kept in the garage. and it's particularly tough to remove, but that's not the only problem with this painting. This layer of paper here is obviously quite a poor quality acidic paper. It's very fragile. That's very yellow. Obviously, that is from acidity. That's usually come from the wooden backing. This paper is noticeably more yellow on the back than on the front. It hasn't allowed the acidity to travel through here. all these pigments, and then the foxing would be reduced. Well, that's quite a lot of detailed restoration, which is going to take time and precision. So let's talk money, Louise. That sort of thing would cost in the region of £160 to have done. -Do you think you might like to go ahead with that? I think this picture is worth between £400 and £500 in its current condition. it could get upwards of £800, that's if it went to auction. But Alan's not interested in price as its of great sentimental value, and he wants to keep it. so Alan can hang it with pride on his bedroom wall. It's been some time since these school halls were filled with local folk. Our restorers are busily gluing, cleaning and sometimes taking apart your treasured possessions. It's all part of the Restoration Roadshow. which arrived with a split in the wood. so he has kneaded down the marquetry to secure it and make it flush. And now he's tackling the small crack in the wood. a little bit of an opening here. So I've put a tiny bit of rosewood veneer in the split itself, I've glued it in. It has bridged the gap. I've then trimmed the veneer back. comes across, rather than using a chisel, chisels can be quite big and bulky. Even the smallest chisel can come across and remove the finish on either side. I've just tidied the whole thing up and the next stage is just a bit of colouring. Rod first uses wax to fill the crack. which he has mixed up to mask the repair. I think that should be it, really. but it's a risky process. Absolutely important that nobody tries this at home. And Tim needs help to recane this child's rocking chair. Will it get in shape so it flies at auction? Alan Cantor brought in this unusual Indian painting. back to her workshop, where she's hoping to out fox that nasty foxing. to draw out the stains, and she has to get it just right. because of the pigments that are here. We don't want them to become damaged due to the pH being too high. Once she's got the right mix, Louise carefully dabs the liquid on to the precious artwork. I'm just applying this solution with this very fine acrylic brush. because it will cause too much bleaching. attempt this sort of treatment. and this is absolutely never to be attempted. It has a terrible detrimental effect on paper. OK, Louise, we get the message loud and clear. Experts only. I'll leave that for perhaps half an hour and then come back to it and apply some more. And we'll see if those fox stains are any lighter. and will Alan be pleased with the results? Tim was given the difficult job of trying to recane this lovely children's Victorian rocking chair. He's had quite a task and has had to call in caning specialist Frances Richmond to help him. She's had years of experience. I've never seen a child's rocking chair like this before. It's the same number of holes, but just miniature. Because it's a smaller seat, doesn't mean it's less work because the holes are closer together. -It's probably more work, because it's tighter to weave in and out. Frances has 94 holes to fill. How does she get the cane to feed through so precisely and tightly? with the curve, all the weaving has to be held in place by knots. That's because it's finished off by having a beading round the edge. I'm just doing the corners at the moment. to complete her part of the restoration. give a little bit of shine to it. And it's going to look pretty special, actually. be moved when they see the finished chair? It's been a busy yet satisfying day here at Stonyhurst for our Restoration Roadshow. of toil and sweat, our experts return those precious family treasures to their rightful owners. Oh, golly, that is spectacular compared to what it was before. 'which belongs to Fergus Brown. It's crunch time. Let's just do what we need to do. Here we go. Wow! Yeah! Crikey, that's really come up nicely. -I think it's brilliant. I think it's a fantastic job, and it's come up beautifully. Remember when this table arrived the inlay was raised, the inside cracked and tired-looking. Now it's been carefully repaired with matching coloured polish. has been replaced with a bit of rosewood veneer. so the whole thing feels much smoother. -You want to just run your hands along it. It's a lovely piece. I do love it. It came from my old home, but it's not being used. To me, that's probably criminal, really. It's best to just move it on and let somebody cherish it. Let's hope we find someone to do just that when it goes under the hammer. 19th century Madras painting, which was given to Alan Cantor by his father. Goodness, it's gone white. Absolute... miracle. It looks the same, but it doesn't look the same. I'll work that one out. One can see the bull. There are more animals in it then I saw before. Before, this piece of art was badly blemished. But after Louise gave it her expert touch, it looks clean and bright. The discoloration that had taken over this Indian art work has disappeared. And what used to lurk under the gloom of dirt has now been lifted, so you can see the detail. Look at the way that tiger stands out. Before it was just in the bull and it looked flat. And now it looks as if it's on the surface. -Do you think it was money well spent? so I wake up each morning and I see the picture. It's so good to see these family treasures being given a new lease of life by our skilled restorers. or bring a tear of joy to you when we give them back. which he is taking to auction, and we're hoping it might reach the £500 mark. As we have seen, owner Alan is delighted at the results of his Indian painting. So now it's time to see how Tim has got on with that lovely Victorian children's rocking-chair. It was looking a bit tired and needed a new seat. Owners Pauline and Bernard paid £120 to get it restored. I didn't think the frame would clean up that well. That's brilliant. Before the chair had completely lost its cane seat and it looked drab, battered and bruised. Now it has an intricately worked seat and is polished to bring out its natural hue. That was lurking beneath it all the time. Are you tempted to sort of take it back for Ted, or what? the house the first weekend and say, "Where's my chair, Grandma?" But they are keeping to their original plan and it's going to auction. The bidders are arriving and looking in anticipation at Silverwoods in Clitheroe. now it's been restored to full health, so they've put a relatively high reserve of £240 on it. Remember, before restoration, I valued it at £50. To restore it cost £120, and now I think it's worth around £150. So with a £240 reserve it's something of a gamble. recently recaned, as you can see. A nice little thing, is that. There we go. We're on. Who will start me at what for this one? 250 to set it off. I have 150 bid. 160. At 150. 160 from anybody else? At £150, where is 160 for this one? Are you all quite sure? At £150. All done at £150. All finished! That's exactly your estimate, isn't it? It was. It was, I'm afraid. but there's a little girl who's gained in another department. My little Sophie will walk in the house and give me a big kiss and say "Thank you, Grandad". -Well, that's got to be worth more than 150 quid. really wanted to keep their chair all along for their granddaughter. Next up, we have the Edwardian card table brought in by Fergus Brown. He inherited it, so it cost him nothing. Rod charged £230 to restore it, and I'm hoping the bidders will love this table. It's a real gem and it should get £500. Let's see. Now we have the attractive Edwardian inlaid rosewood card table. I like that. Thank you, auctioneer. Attractive. Did you hear that? He's on our side. I will start the bidding at £300. Can I take 320 anywhere? 320, 340, 360, 380. 400? 420. 440. 460. 480. -500. 520. 540 in the room. Selling to the lady at £540. bearing in mind it cost £230 to restore. Fergus can't be here today, so I'm going to call him and tell him that the good news. You had a card table came up for auction today. And there were quite a few people wanting it. In fact somebody had to pay £540 for it today. restorers we've managed to put some smiles back on our owners' faces. 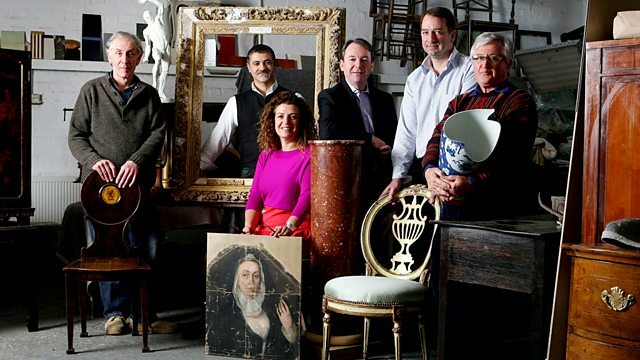 Series devoted to saving heirlooms from the scrapheap, restoring them to their former glory and maybe even making money at auction. Eric Knowles and his team of expert restorers face another severe examination of their skills at Stonyhurst College. With members of the public bringing along all manner of damaged treasures, the team soon has to deal with a rocking chair that needs serious support and a Madras painting that looks distinctly off-colour. As the pace hots up, someone arrives with a lovely Edwardian card table that's had real punishment dealt out to it over the years. Will the restorers come up trumps and turn it into a winner at auction?